After three decades of setting the standards for Dimensional Stone, Cut Above took some bold new steps to set the pace for the next 20 years. Since 2014, a new vision, energy and ownership has made a commitment to transform a one site quarry into a business focused on a mission of meeting and exceeding customer expectations for all of their Natural Stone needs. We now operate from several locations across Ontario, provide cut and guillotined stone and provide a wide range of specialty products. Our commitment to Safety and the environment are second to none. The entire team at Cut Above Natural Stone is excited about new products and possibilities as we continue to expand and evolve with our valued customers. Thirty years ago, a pry bar and a tractor were responsible for armour stone extraction and door to door delivery on a straight truck was the way we built the company. Today, a well trained team of certified surface miners operate a fleet of Heavy Equipment in several locations across Ontario to meet demand. We have standardized language and product specifications to ensure our rigorous quality expectations are adhered to. Our courteous and energetic customer support team are dedicated meeting and exceeding expectations. We now have the capacity to supply massive Infrastructure Projects, Governments, Contractors and Stone &Garden Centres alike, on a year round basis. Customers from as far away as Western Canada and the United States have come to rely on us for all kinds of stone products. As Canada’s leading natural stone supplier, we are here to serve you! Our inventory was made about twenty million years ago! Today we recognise and respect the value of our non-renewable resource. While lots of companies can crush and convert limestone into manufactured mass produced concrete shapes and slabs, we continue to provide timeless, natural one of a kind stone products. Our customers understand the superior qualities of authentic natural stone and demand nothing less. We work hard to avoid the damage and fracturing effects that blasting can have on landscape stone. This is why nearly all of the stone from Cut Above is extracted using blast free techniques. It may take us a longer time to extract and process the stone by using our Slab Bucket method but we think it is worth the investment in better quality and our customers seem to agree. All of our products, from Armour and designer Armour stone to Natural steps and Flag stone, are carefully extracted, graded and sorted for size and quality and product type. Our in-depth industry experience has enabled us to better understand and meet the evolving needs of our valued customers. 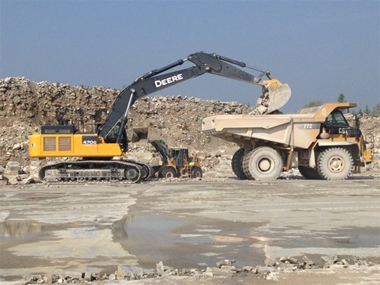 By continuing to invest in the latest quarrying equipment, technology, and highly-experienced staff members, our company has continued to produce and source unparalleled landscape stone products. All of this adds up to why many consider Cut Above Natural Stone among the best landscape stone Quarries in Canada.